Filling your company’s pipeline with a steady flow of qualified leads is the name of the game. Without great leads, even the best remodeler in the world will go broke. Filling your company’s pipeline with a steady flow of qualified leads is the name of the game. Without great leads, even the best remodeler in the world will go broke. And for your peace of mind, you need to know with absolute certainty that you can get all the leads your company needs, whenever you need them – no matter what time of year, or the state of the economy. These two manuals are two of the most powerful methods developed for generating qualified leads. Book #1 covers everything you need to ensure your firm stays flooded with high-quality referrals. 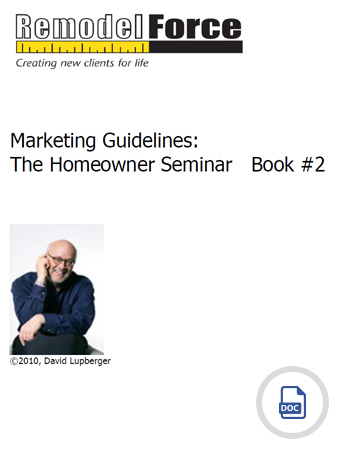 Book #2 lays out the step-by-step details on how to host a homeowner seminar; a marketing tool that will differentiate your company from other remodel firms.